The Jersey Shore. Seaside Heights, Long Beach Island, Asbury Park. Those are the places that I can shut my eyes and see when I think of the shore. Especially Seaside Heights and Long Beach Island. When we were kids we always spent a few days in Seaside Heights, playing in the sand, running in and out of the waves and then just hopping and jittering till we could get to the boardwalk. As young adults down there on our own, it was the place to get out of the sun, cool off with vodka lemonade and find something to eat. Walk away Sundaes (A block of Neapolitan Ice Cream in a specially sized square-topped cone with chocolate and a cherry), fried shrimp in a cup, salt water taffy, and sausage & pepper sandwich. The boardwalk was magic when you were young, flashing lights, music, games of chance and food stalls, a virtual kaleidoscope of sights, sounds, and smells changing every few yards. A carnival stretched out along an elevated wooden sidewalk along the beach. Every hundred yards or so there would be another sausage and pepper vendor, usually with lines waiting for their turn to bite into their “must have one” at the shore. 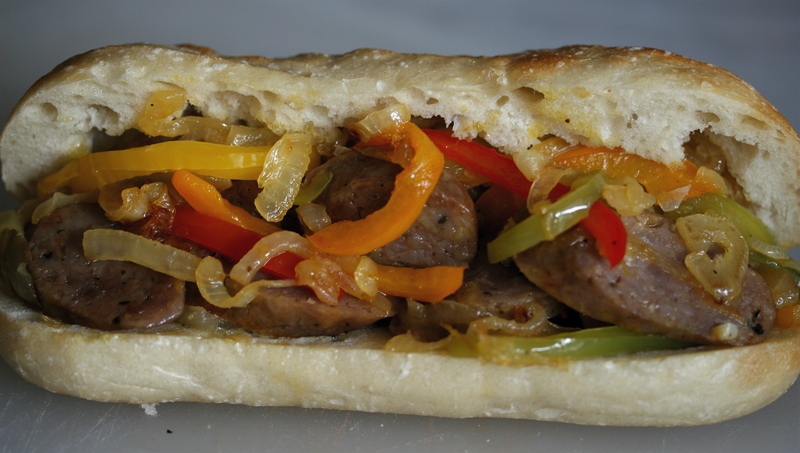 It seems like such a simple thing, Italian sausage, peppers, onions on a roll. It actually is simple. Put them all together, browned, juicy sausage, melting onions and peppers, and a sandwich roll that’s soft but with a firm bite and a bit of a crunch to the shell. The whole is much more than the sum of its parts. Every time I make them I can see those big flat top grills, piles of onions and peppers on one side, sausage split down the middle lined up on the other and space in the middle where a they came together and spent a minute forming their special alchemy before getting scooped up with a wide flat spatula into a waiting bun with a napkin already under it to be handed to the next person in line. It’s a special place in heaven, where you can lean against the wooden railing, with the waves crashing behind you and a salt air breeze cooling your shoulders. Watching the crowd walk by, listening to the music from 10 different places, the screams of joy from the people on the rides. You eat your sandwich and look at the sky where the stars seem to smile down at all the fun. The Jersey Shore. Sausage & Pepper sandwich. Life can be so good.